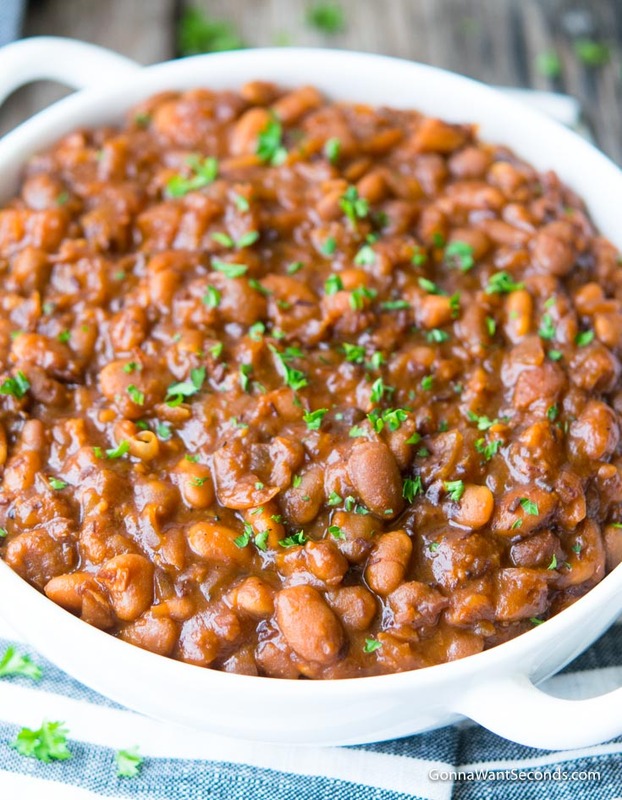 Crockpot Baked Beans-Perfect Side for Dinner or a Potluck Year 'Round! Our crockpot baked beans are thick, meaty and delicious! 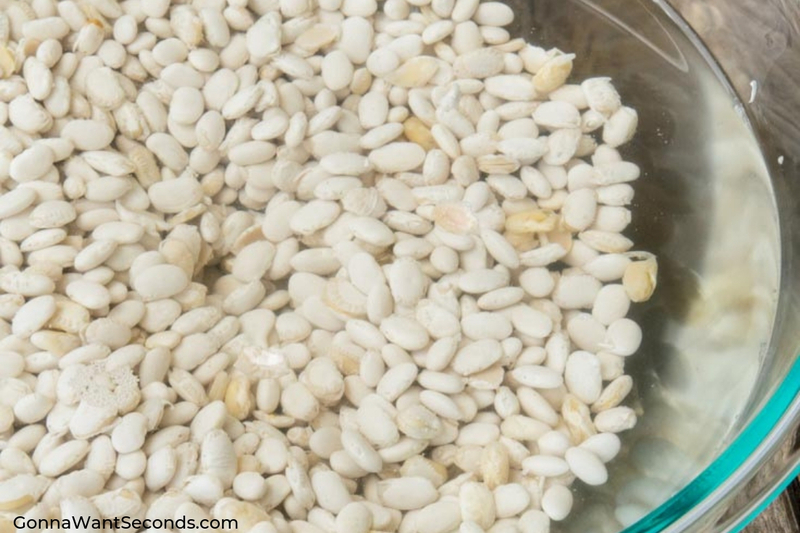 These beans are the perfect compliment to your dinner table, potluck, or BBQ all year round! 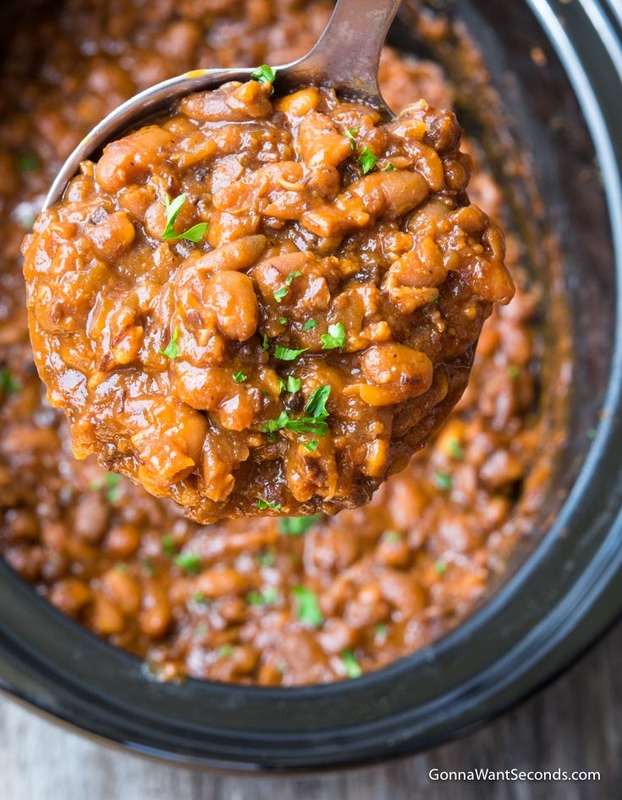 No one will believe it when you tell them you didn’t slave for hours over these incredibly tasty Crock Pot Baked Beans, or that you didn’t work some kind of magic to conjure up all the flavors going on in this recipe. I would bet that anyone who tries them, will not only beg you for the recipe but will adore you for life for giving it to them! How Do You Make Crockpot Baked Beans? I’m kidding, I’m kidding! 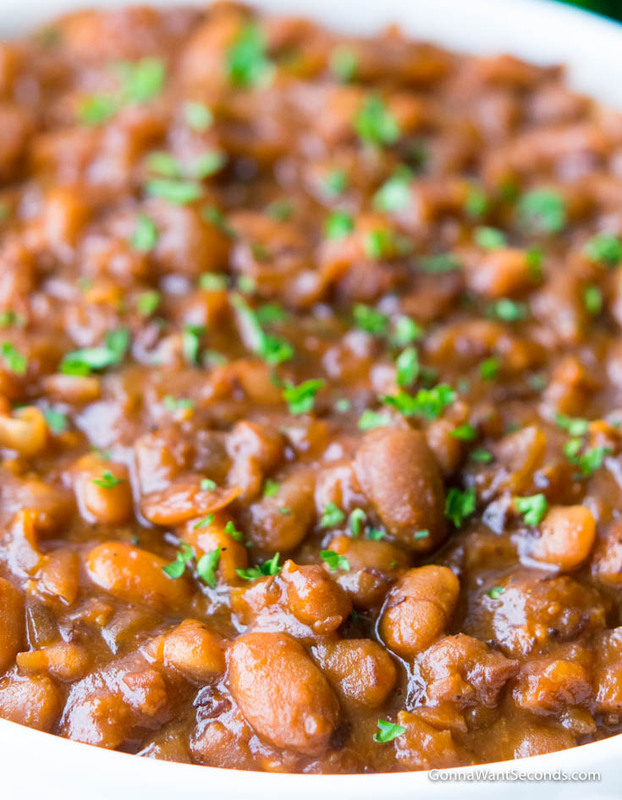 Like most slow cooker recipes, crockpot baked beans are easy peasy, and that’s why we love them! Be sure to soak the beans overnight, and drain them well before putting them in the crock. Toss in the rest of your ingredients, mixing well, but hold off on the salt. When the beans are tender (we’re talking on High for 10-12 hours–yes, you read that right! It’s not a typo, HIGH for 10-12 hours! ), you can sprinkle the salt on in and let the flavors marry for another 30-40 minutes. Yum. 1. Soak navy beans overnight. 2. Drain beans well and add to the crockpot. 3. Add the remaining ingredients (except salt) and mix well with the beans. 4. Cover and cook on HIGH for 10-12 hours. Add salt when beans are tender, stir and continue cooking for 30-40 minutes. 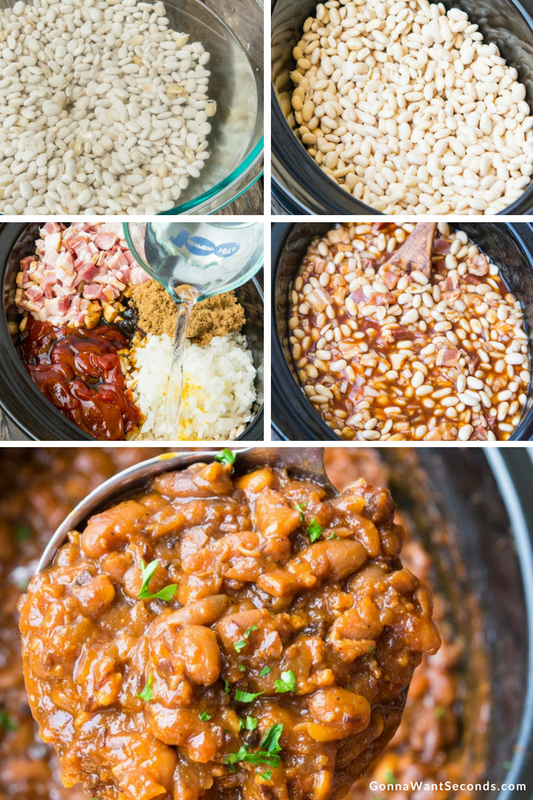 Like most slow cooker recipes, Crock Pot Baked Beans are easy peasy, and that’s why we love them! Making this incredibly easy baked beans recipe is almost 100% hands-off. The slow cooker does all the work, and it does it beautifully. If you’re looking to warm up and warm up your kitchen too, try my Calico Beans for a delicious and beefy oven baked bean alternative. Wins all around! Another exceptionally flavorful beany recipe is my 15 Bean Soup. It even sounds impressive, right? Check it out! Have you tried my Three Bean Salad? This is a classic, colorful, and tangy Southern dish that always adds beauty to any potluck table. Speaking of Southern, my Southern Style Green Beans are so Southern because they’re loaded with bacon flavor, and you “cook ‘em to death” as my mom would have said. Meaning, you cook them forever – until all the nutritional value has long disappeared. But, oh well, that’s what makes them Southern! Can You Make These Homemade Baked Beans Ahead Of Time? Absolutely! You can make these homemade baked beans ahead of time, and then either freeze or refrigerate. 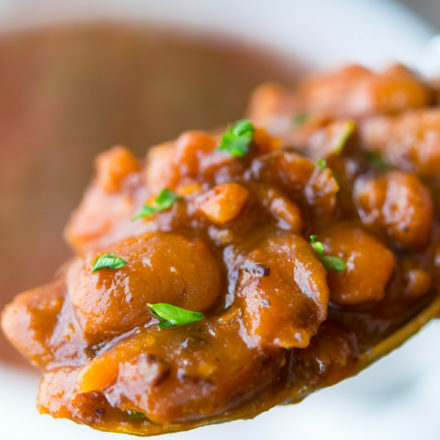 Not only can you freeze Slow Cooker Baked Beans, but they freeze like a dream! Pack up any leftovers, or the whole shebang if you’re making them in advance, and store them in an airtight container. My grandmother would have scoffed at that and told me to tell you to toss them into a one gallon Ziploc bag and be done with it. Either way is fine, and they will last as long as eight months! My recipe can also be tweaked as a slow cooker baked beans recipe using canned beans. The freeze guidelines are the same for both methods. Store them in the portion size(s) you prefer, heat them up, and enjoy. What Do You Serve With These Easy Baked Beans? I always answer the question about what to serve with these easy baked beans the same way. Nothing goes better with Crock Pot Baked Beans than my Pioneer Woman Mac and Cheese. When you eat these two together, you’ll feel so warm and fuzzy inside, you’ll have turn down the thermostat! Are These Baked Beans With Bacon? My Crock Pot Baked Beans are a version of baked beans with bacon, but that name just doesn’t do them justice. 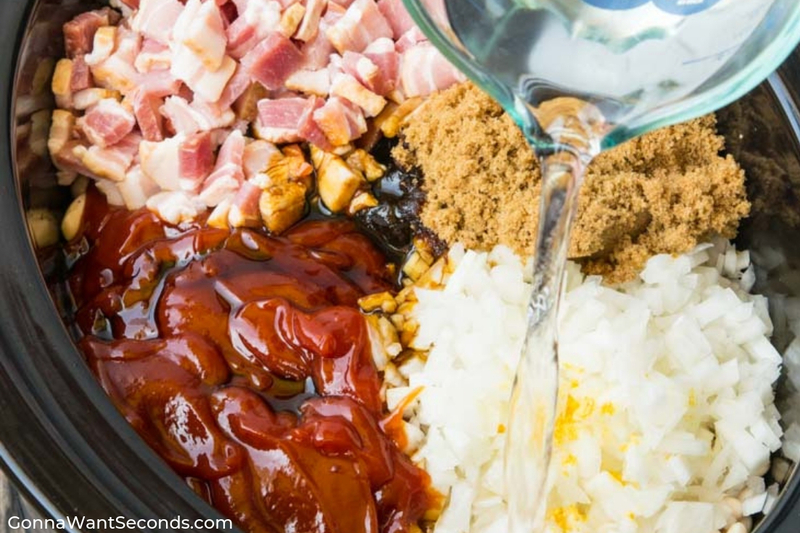 Not only do these slow cooker baked beans with bacon offer many flavors other than bacon, they slow cook to combine all the flavors into a masterpiece. Try these quick and delicious variations of baked beans! BBQ Baked Beans combine some unique ingredients to create a baked beans recipe that’s off the charts with flavor! As long they’re bacony and smoky, they’re Southern Baked Beans! Bring on the crock pot Baked Beans with Ground Beef! Like my Calico Beans, add a pound of lean, browned, and drained ground beef to your ingredient list at the beginning of cook time. 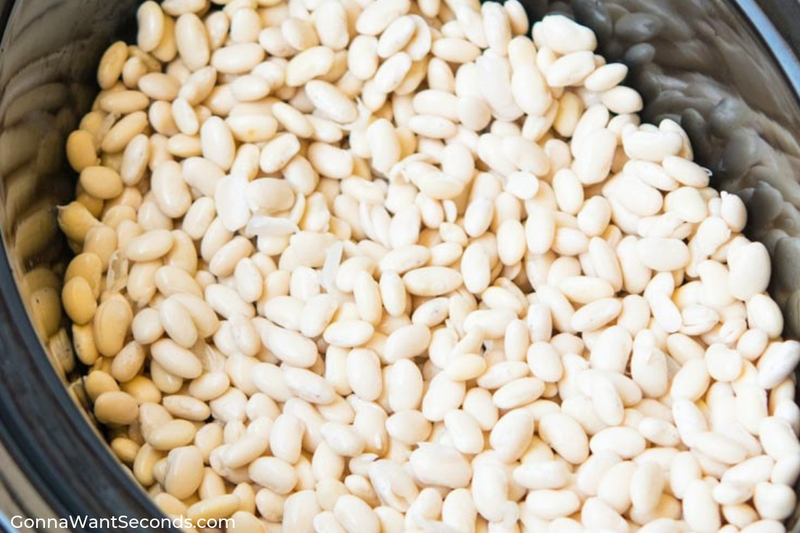 This is a fantastic and filling addition that awards these beans the title of the main course as opposed to a side dish. I love Baked Beans From Scratch because I know exactly every ingredient that goes into them! Cook Time: On High 10-12 hours! Don’t even think about using the low setting for this recipe! I know it’s unusual, but even if you soak the beans the night before and wait to add your salt once the beans are tender, these beans take a LONG time in the crockpot! It’s all hands-off cooking time so you just need to simply plan accordingly. Don’t forget to add the salt when you’re into the final 40 minutes! Time Your Seasoning: Crockpot baked beans really pop when properly seasoned. Spices and aromatics are put into the slow cooker with the beans at the very beginning of the cooking process. This gives them almost 10 hours of simmering to combine for a flavorful delight. Salt: Add the salt well into cook time, about 30-40 minutes before the beans are done. You want them to be tender for sure, and adding the salt at this time will not only achieve the flavor we want but will keep the beans from turning to mush. Mix Your Beans: Don’t be afraid to experiment with beans! Try a mash-up. My recipe calls for three cups of navy beans. You can easily substitute red kidney beans, pinto beans or black beans! Try one cup of each, and not only do you have a drool-worthy creation, but a serious dose of protein and fiber! Ham: Slow cooker baked beans with ham as an add-in will give you a great flavor switch up. It’s a good way to use up any leftovers, and comes in ham-day after Easter, Thanksgiving, and Christmas! Ham Hock: If you happen to have ham hock on hand, it truly adds a rich and smoky flavor to crockpot baked beans. The meat falls right off the bone. My husband, a known bean adversary and a dyed in the wool meat eater, comes to the dark side when I cook these beans with ham hock. He can’t resist them, and you won’t be able to either! Vegetarian: It’s super easy to convert my Crock Pot Baked Beans to slow cooker vegetarian baked beans by leaving out the bacon. And, they’re still super delicious! Canned Beans: No time for 10-12 hours of slow cooking? No worries! 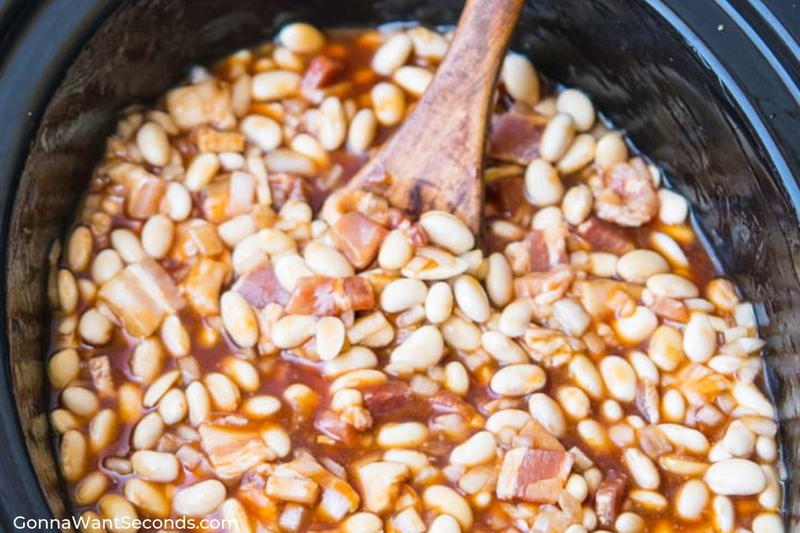 You can make slow cooker baked beans using canned navy beans. You’ll still get a flavorful delight! 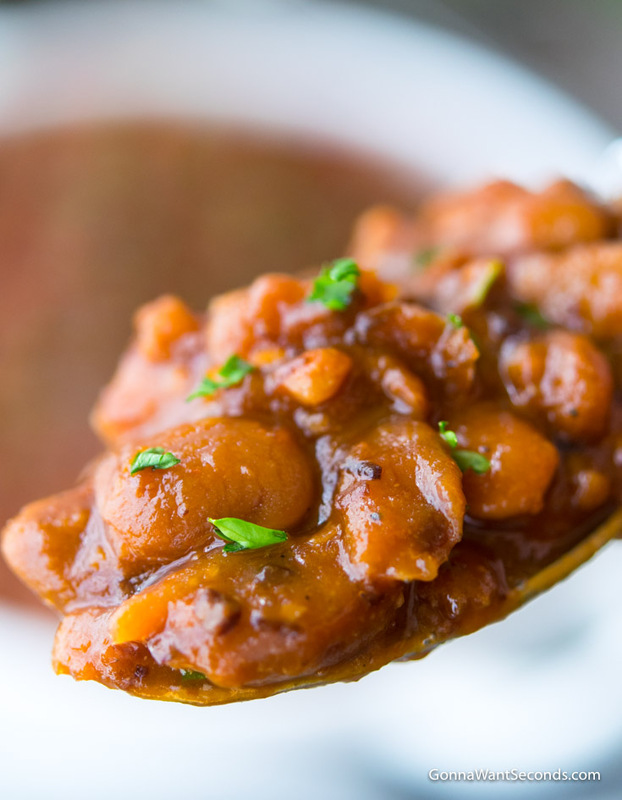 You’re going to fall in love with this Crock Pot Baked Beans Recipe! I can’t wait to hear how you liked it! Let me know in the comments below. Drain beans well and add to the crockpot. Add ketchup, water, molasses, onion, dry mustard, bacon, brown sugar, and black pepper and mix well with the beans. Cover and cook on HIGH for 10-12 hours. Add salt when beans are tender, stir and allow to continue cooking for 30-40 minutes, covered, so beans and salt can marry and combine and beans are cooked completely. 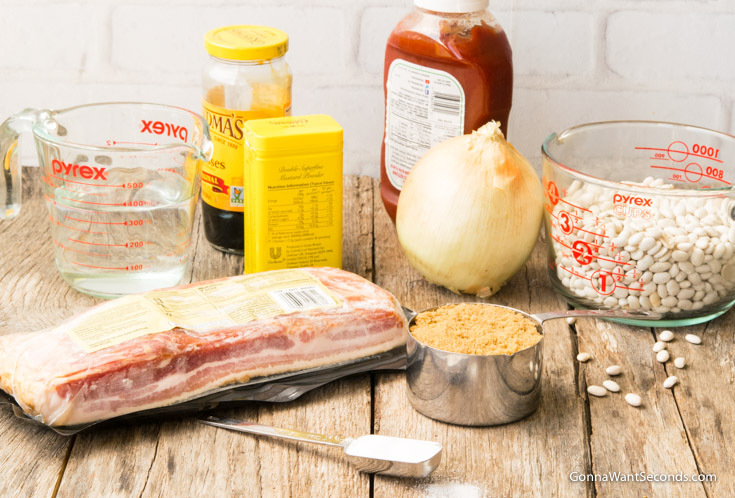 do you cook the bacon before adding it ? I’ve had terrible luck with dried beans in the past (they never seem to properly rehydrate). Maybe because I’ve never cooked them for 10-12 hours. These sound delicious and I’m planning on BBQ chicken this weekend. I’ll give it another try! T. y. For this Amazing recipie. I love that i didn’t have to wade thru a million ads. I shall try this for Labor day for a crowd of 25+. Thank you again. I hope you enjoy! Remember to check out the cooking time! !